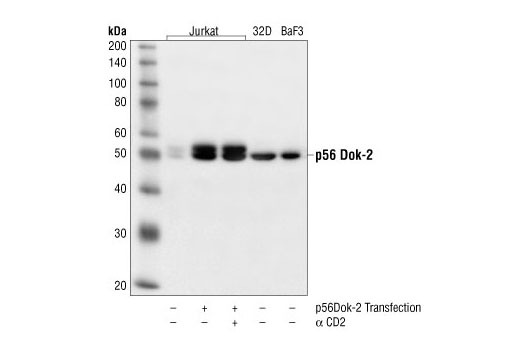 Western blot analysis of extracts from Jurkat, 32D and BaF3 cells, transfected with p56Dok-2 and/or anti-CD2-treated as indicated, using p56Dok-2 Antibody. p56Dok-2 Antibody detects transfected levels of total p56Dok-2 proteins. The antibody does not cross-react with other p62Dok family members. Polyclonal antibodies are produced by immunizing animals with a synthetic peptide corresponding to the residues at the carboxy-terminal sequence of human p56Dok-2. The antibodies are purified by protein A and peptide affinity chromatography. Di Cristofano, A. et al. (1998) J Biol Chem 273, 4827-30.